Premix asphalt, although currently the most inexpensive initial-cost wearing course, has not proven to be the most effective or economical long-term solution, particularly in large areas. The inherent poor compaction and oxidized bitumen binders and U.V. degradation, results over time in 'drying-out', shrinkage and, together with heavy traffic-flow, general breakdown which will adversely affect the waterproofing membrane. Proper compaction can seldom be achieved because of restrictions in the weight and type of the rollers that may generally be used. In small areas with light or occasional traffic a reasonable life can be expected. Experience has shown that the final compacted thickness of the asphalt should not be less than 40mm (normally two layers of 25mm, compacted to two layers of 20mm). The asphalt is to be laid on an isolating layer of Interdek or a geotextile that is spotbonded to the waterproofing membrane with a bitumen flashing compound. This is a temporary means of laying out the isolating fabric whilst the premix asphalt operation is proceeding and reduces subsequent stresses on the waterproofing membrane resulting from differential movement. In those areas where continuous high traffic flow or the 'braking' effect of vehicles is anticipated special precautions are to be taken to prevent excessive 'flow' movement in the premix asphalt. Reasonably regular maintenance of the asphalt, such as over coating with a slurry, should be carried out. The premix asphalt is laid to a uniform thickness, therefore positive drainage at waterproofing membrane level should be achieved. A minimum finished fall of 1:80 is generally accepted to ensure adequate water runoff. To achieve this minimum finished fall, the roof should be designed with a minimum fall of 1:60 allowing for directional changes and error. Ensure that ponding of water does not occur. 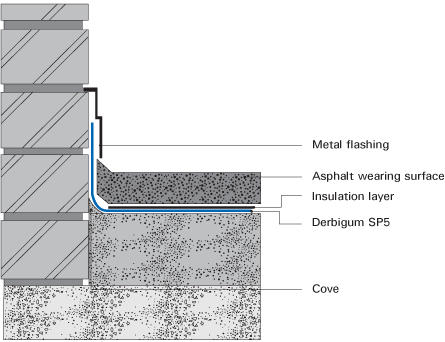 One layer Derbigum SP5 waterproofing membrane, laid staggered, with 75mm side laps and 100mm end laps, sealed to primed surfaces by “torch-fusion”, followed by a layer of Bidim or Interdek geotextile with 50mm laps, spot-bonded to waterproofing with bitumen flashing compound as isolation/protection layer to receive premix asphalt (elsewhere specified). Waterproofing to be installed by an Approved Derbigum Contractor under a ten year guarantee.